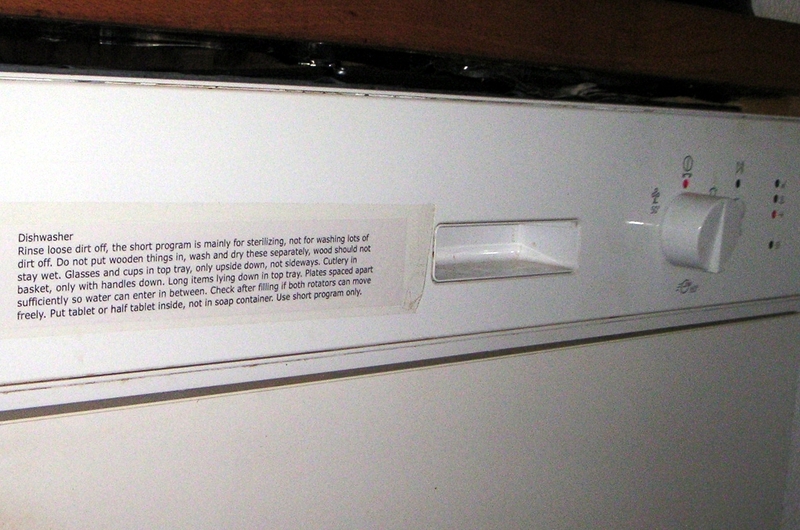 On February 1st last year I posted our address in the blog. 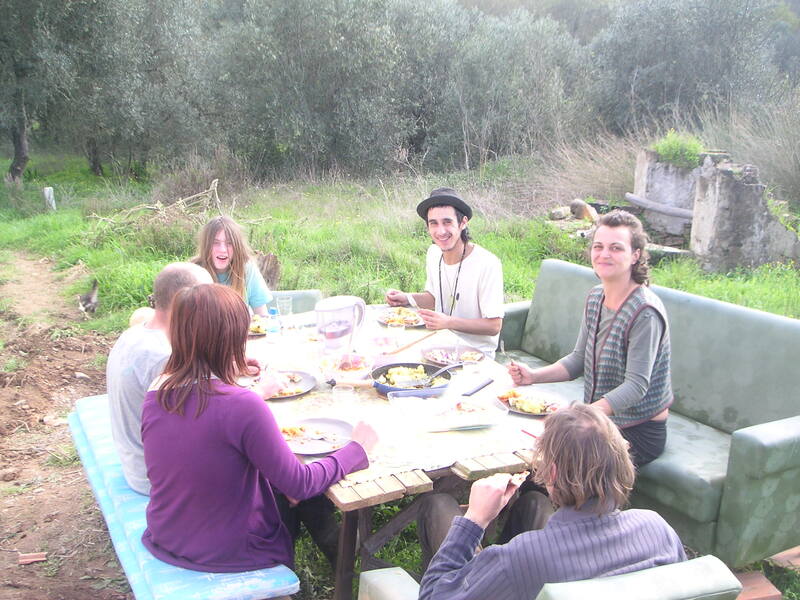 It is one year now since the land and house in Sabóia changed ownership and Osho Garden in Portugal was born. For her first birthday she got her drainage channel all along the west side of the house finished. Presented by our combined efforts and a major step towards ending our sticky mud epoch. Afterwards we posed with these motley would-be party hats. Xicca visited today to look at our progress. Her plans involve crop rotation and companion planting to save soil nutrients, prevent the build-up of pests and diseases, repel insects, and enhance growth. And succession cropping to get the most out of our vegetable garden by planting a little bit at a time, or a second crop in the same place for a second harvest. Her visits are an ongoing course in Permaculture. More seed trays are being installed in the garden dome today. In a way our lives are developing like these plants, from a potentiality into evolved beings. We grow by nourishing the seed, finding a place under the sun and accepting the rainstorms and the freeze as well. Proper care for our body and soul allows us to become healthy and strong, and evolve into the giant tree or the magnificent wildflower that we were intended to be. In the garden dome the first seed trays are now installed. 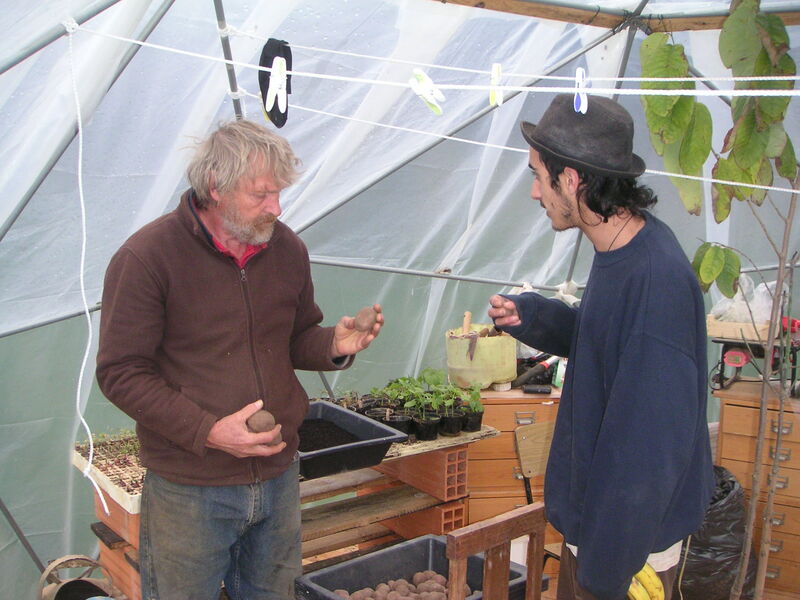 In the picture Sumeru this morning explaining to Ruben about seeding potatoes. One must watch to plant the correct side up, as the sprouts grow only on one end of the potato. And it’s best to choose only healthy looking big ones. Many of them are already planted, yesterday and today, in rows running from North to South, starting at the Southeastern side of the tree circle. Xicca is still adding more details to the garden layout every week and it is beautiful to see our vegetable garden finally taking shape. 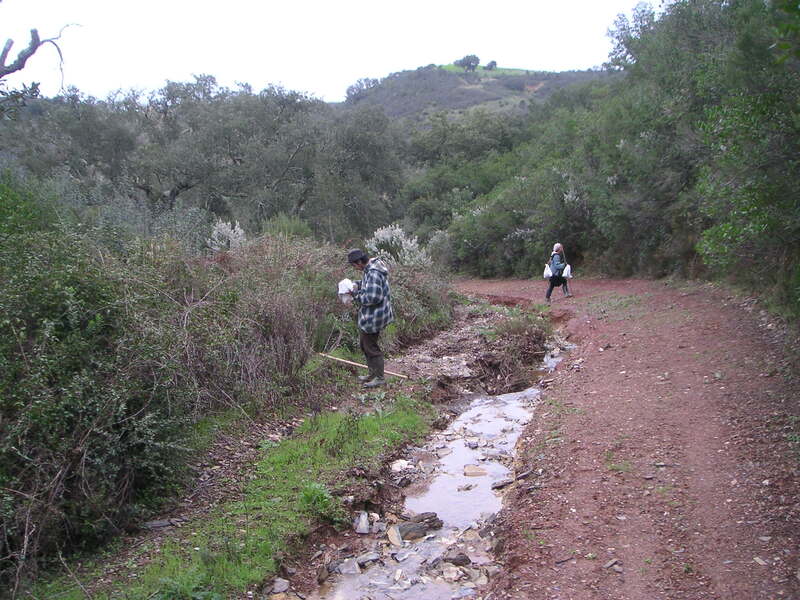 Then I went to the land for a one day walkabout with Ruben and Mafalda. We took bags full of stone oak acorns with us and started walking up the hills on the West side, since two weeks ago we already did the Eastern side. We planted a total of 331 of them if we counted well. We hope for a couple of hundred of these big evergreen trees in due time and that we will then still be fit enough to enjoy them. 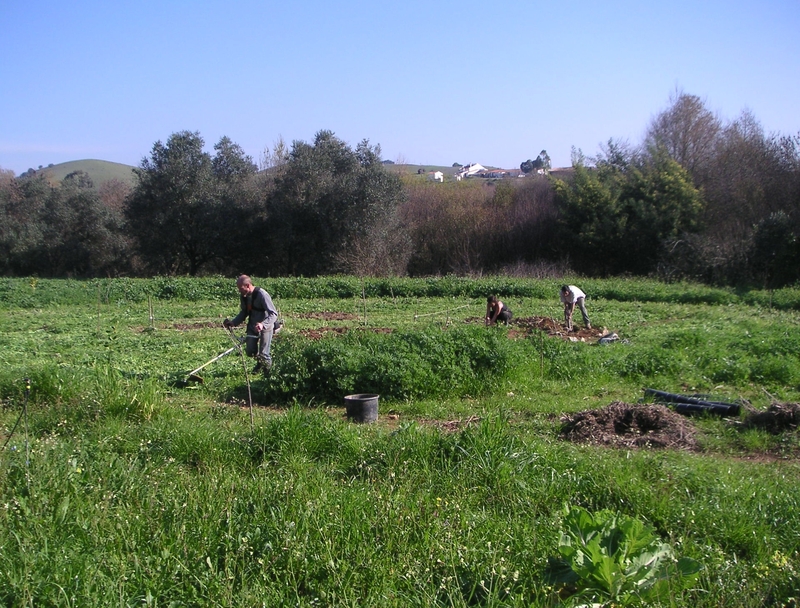 Mafalda and Ruben prepare plant beds in the tree circle while Chris mows down the Lupins that serve as green manure. It feels like spring time and more so because the seed suppliers in Odemira sold me beans and peas, onion, carrot and cabbage seeds and seeding potatoes today, saying that they can all go into the ground now. 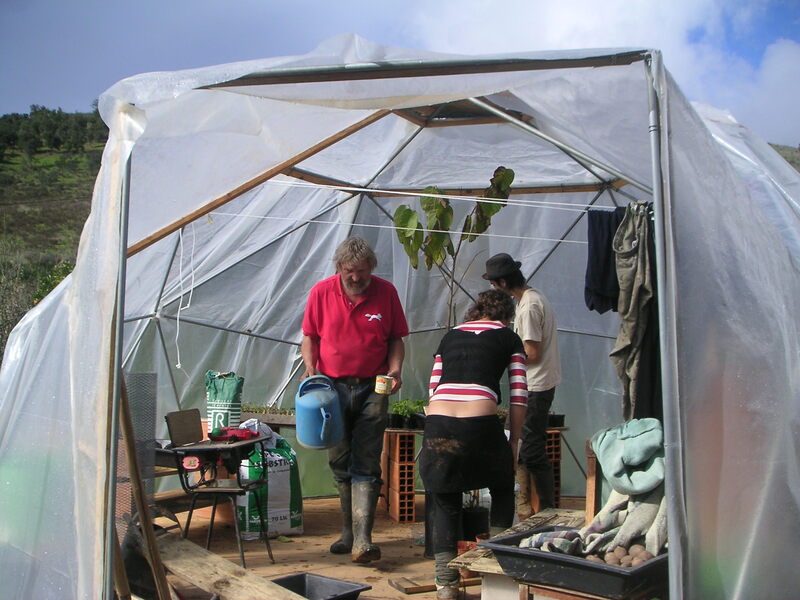 Other vegetables will be seeded in trays in the garden dome and planted out in March. 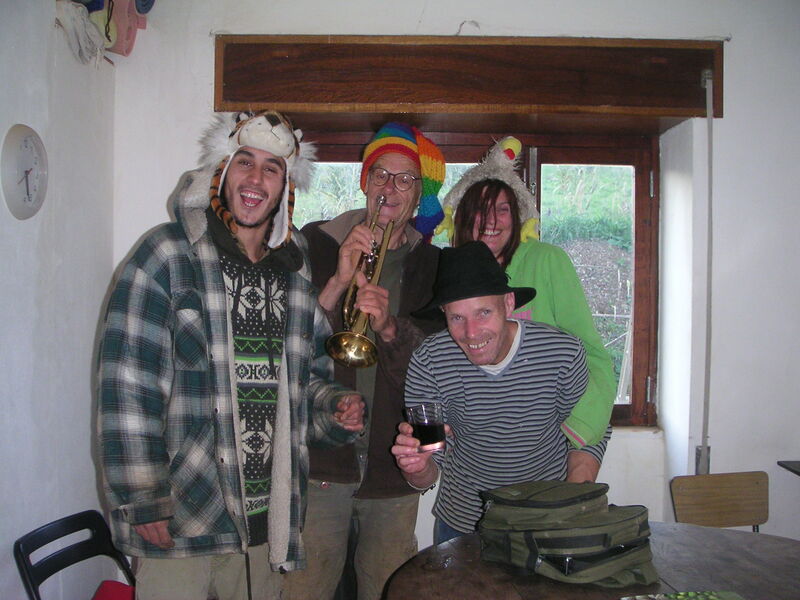 ‘Commune life can be very rich because we share with many friends. Sharing property means that we can afford to have more, but it also means things are more at risk of wearing out or being damaged.’ Thus begins our list of house rules that has been growing to 5 pages over the past year. I just uploaded The Osho Garden Book of Rules so you can print it, and read it in the train when you come to visit us in Sabóia. Chris made pizza and we sat outside for lunch discussing the weather. It doesn’t get much better than this in England, they said. In summer that is. Today Ruben and Mafalda from Lisbon joined us. Ruben plays the guitar and we are looking forward to organize some musical events here. 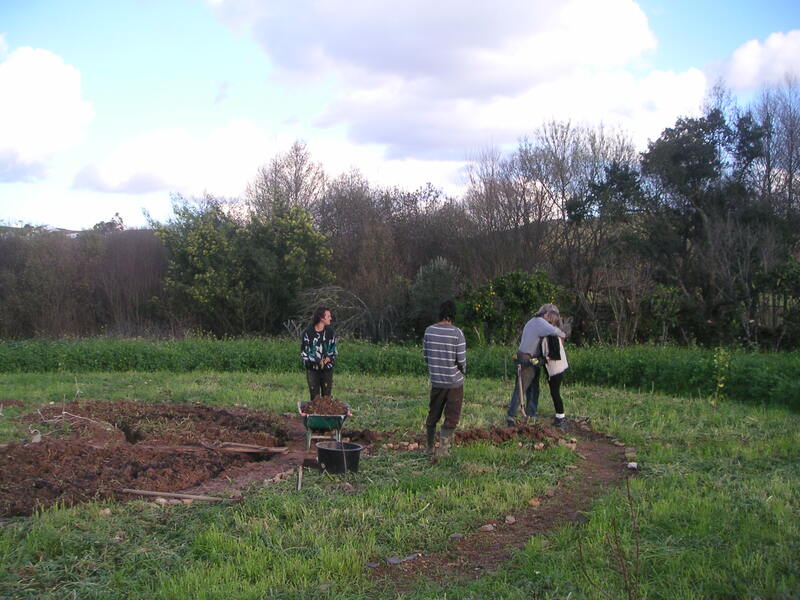 Mafalda is a designer, which comes in handy as we have a whole new Eco-village to design. But here-now they are both gardening.